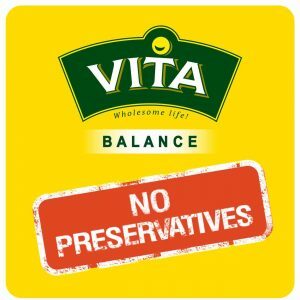 60% whole-grain Vita Balance bread varieties combine all the beneficial properties of the whole grain with great taste, soft texture and variety. Plus, the added super grains and seeds provide further benefits and taste, so that we can be not just healthy, but also happy. 60% whole-grain wheat flour in a perfect combination with 9 super grains and seeds – buckwheat, chia, golden and brown linseed, sunflower seeds, oats, poppy seeds, sesame seeds and soy, each with its characteristic taste and healthy benefits. A soft, multi-grainy and exclusively rich taste. 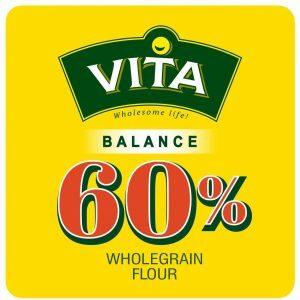 Flour – 65.8% (whole-grain type 1850 wheat flour – 60%*, type 500 wheat flour – 40%*); water; starter (water, wheat meal, liquid malt extract, clean starter cultures); sunflower seeds – 1.6%; oats – 1.6%; brown linseed – 1%; golden linseed – 0.7%; poppy seeds – 0.7%; sesame seeds – 0.7%; chia – 0.7%; buckwheat – 0.7%; soy mix – 0.7% (coarsely ground soy – 40%, whole-grain wheat flour); bread yeast; sea salt; technological additives (fermented wheat flour; antioxidant: ascorbic acid; enzymes); sprinkled with: sesame seeds, poppy seeds, sunflower seeds. May contain traces of: walnuts, milk and its derivative products. The product does not contain GMO. 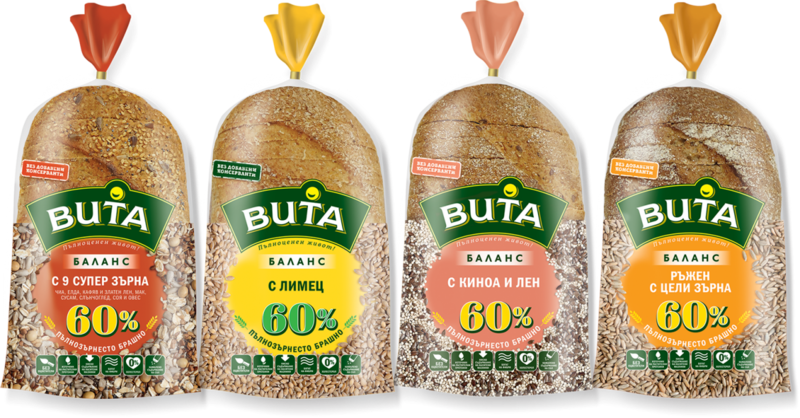 60% whole-grain einkorn flour combined with the soft taste of wheat for a perfect balance between taste, texture, healthy benefits and natural origin. The high einkorn content makes this bread variety very suitable for those willing to reduce gluten consumption. 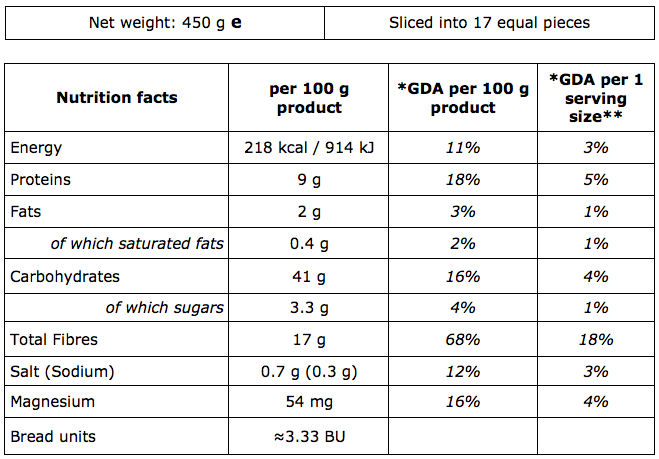 Flour – 68.5% (whole-grain einkorn flour – 60%*, type 500 wheat flour – 40%*); soaked whole grains of einkorn – 3% (pasteurised rye starter, einkorn grains, iodised salt); water; starter (water, wheat meal, liquid malt extract, clean starter cultures); bread yeast; sea salt; technological additives (fermented wheat flour; antioxidant: ascorbic acid; enzymes); sprinkled with: wheat bran. 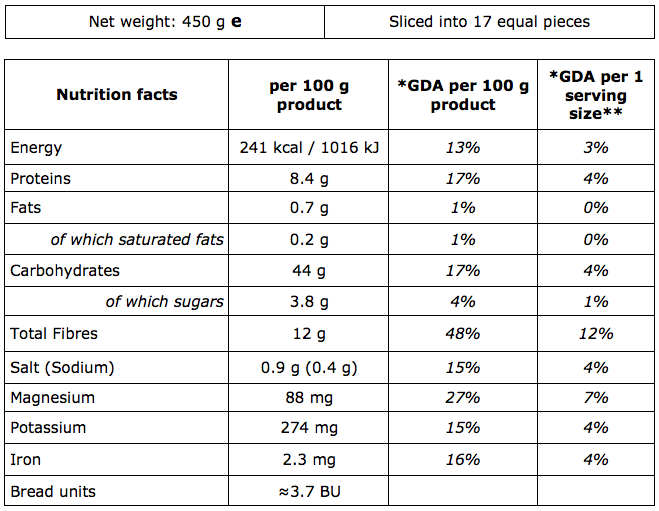 May contain traces of: walnuts, sesame seeds, oats, soy, milk and its derivative products. The product does not contain GMO. 60% whole-grain wheat flour with added quinoa and linseed. With the perfect balance of the healthy benefits of the whole grains and the exclusive properties of the quinoa seeds and linseed, this combination is very suitable for vegans who do not consume dairy products, because quinoa is very rich in iron and calcium, while linseed helps the body absorb calcium as fully as possible. 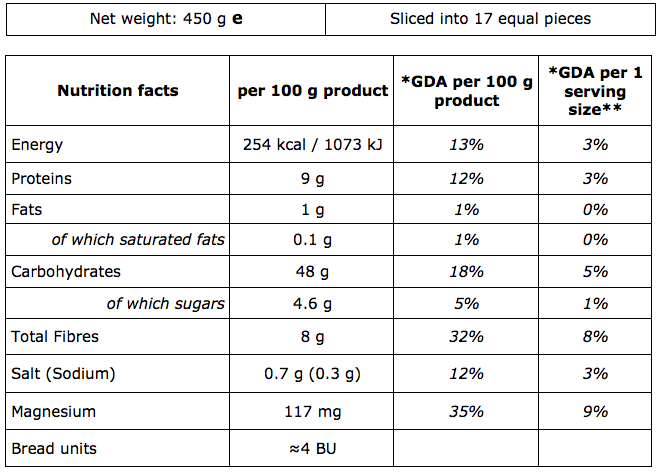 Flour – 67.1% (whole grain type 1850 wheat flour – 60%*, type 500 wheat flour – 40%*); water; starter (water, wheat meal, liquid malt extract, clean starter cultures); brown linseed – 4%; quinoa – 3%; bread yeast; sea salt; technological additives (fermented wheat flour; antioxidant: ascorbic acid; enzyme complex); sprinkled with: whole-grain wheat flour. 60% whole-grain rye flour with added whole sprouted rye grains for added character, taste, flavour and density. 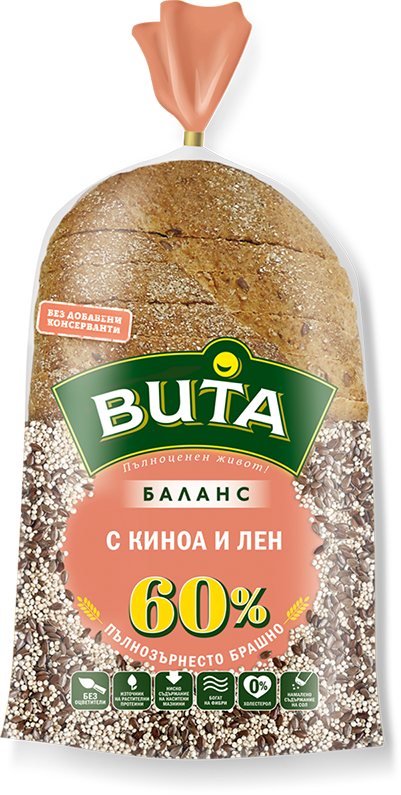 This bread variety is not only tasty, but also a unique option for people willing to lose weight or having problems with their metabolism, because, in contrast to wheat, the rye grains raise the blood glucose more gradually and for a longer period of time. 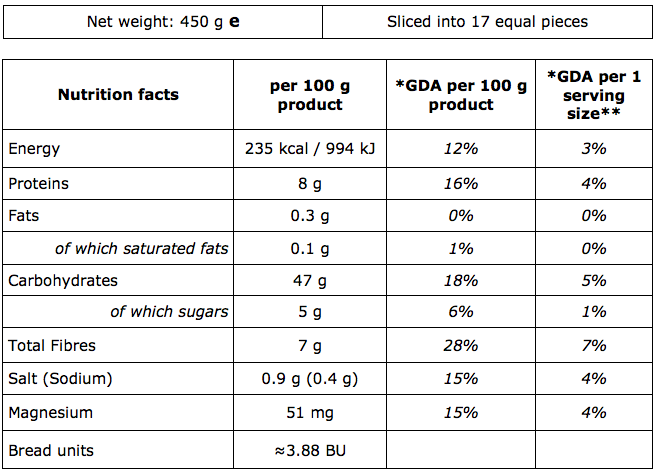 Flour – 65.8% (whole-grain type 1750 rye flour – 60%*, type 500 wheat flour – 40%*); whole soaked rye grains – 8% (pasteurised rye starter, rye grains – 35%, iodised salt); water; starter (water, wheat meal, liquid malt extract, clean starter cultures); bread yeast; sea salt; technological additives (fermented wheat flour; antioxidant: ascorbic acid; enzymes); dark malt flour; sprinkled with: whole-grain rye flour.